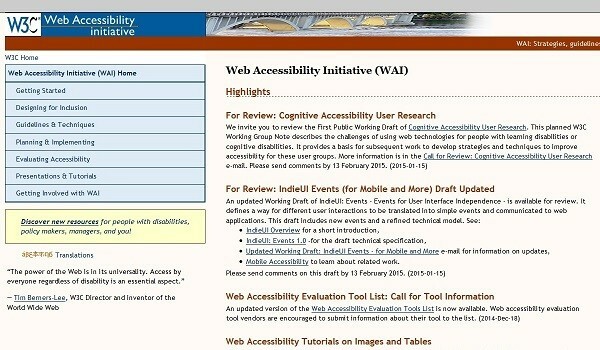 Is your website as accessible as it could (or should) be? Perhaps you don’t think it’s that important? Accessibility is one of the considerations that’s always at the front of my mind (as it should be for any decent web copywriter). As more and more companies provide and actively encourage their stakeholders to access corporate information online, accessibility is becoming an even greater issue. Accessible websites benefit everyone, both visitors and business. But research shows that many corporate websites are still failing to reach even minimum accessibility standards. Service providers in the UK have been legally required to provide accessible websites and applications since 1999. According to the Disability Discrimination Act, businesses have a duty to make reasonable adjustments to enable a disabled person to make use of its services, including those provided online. A website’s design should make sure all users can have full and equal access to both services and information. If not, they run the risk of being accused of discrimination against people with disabilities, followed by being sued and receiving a lot of negative publicity. My initial thought was that it makes sense in some cases. This is from the perspective of corporate, not e-commerce, websites, because this is where my experience lies. Does it depend on audience need? While mobile users may wish for the same experience as other users, for some audiences (such as investors) it comes down to wanting access to business-critical information as quickly as possible. If this is via a simple site with limited navigation, then surely the minimal investment makes sense? An example is the Rolls-Royce dedicated mobile site, which has been around for some years.